I have always wanted to turn a globe. However, when I looked into doing it the problem I encountered was that it would be nigh on impossible to turn it out of solid wood whilst expecting it to stay whole without any cracks and splits developing. I could have turned the globe in two halves and hollowed out the inside, but this too could have led to movement and the piece ending up ovoid in shape. I know the world is not a true circle, but I wanted the item to be as such, so I opted to create my globe using a segmented construction technique. CREATING THE SPHERE: Start by cutting 36 segments each with an inclusive angle of 10° - cross check the drawings here. Glue up nine pieces to form a 90° section - or a quarter of the globe - and use a 90° jig to clamp all nine pieces in place. Once you have done this quadrant/quarter section, do the same to the other three quarters. After all four quarters are dry, glue all four into the sphere. Leave for two days to allow the PVA glue to dry completely. Once dry, bore an 8mm (5/16in) hole right through the sphere from pole to pole and mount on your lathe. I used a reamer tool to fit my chuck and made an 8mm (5/16in) pin to fit my revolving centre. Turn down the sphere on the equator line, to give the basic size required, then cut a hardboard template. 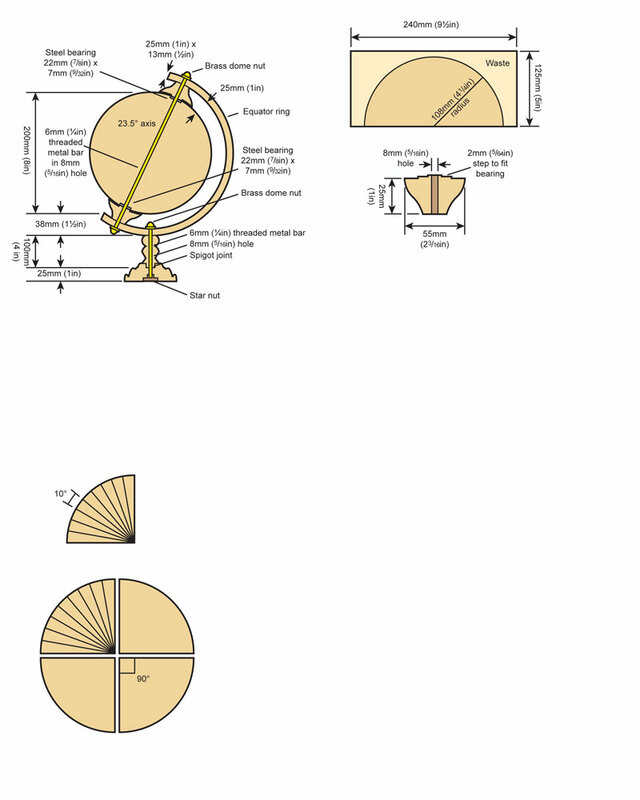 With a radius of 100mm (4in) use the template and turn it pole to pole. This will give a correct sphere. Keep checking with the template to fit the perfect sphere. Sand the piece, cut the equator line in place and finish with sanding sealer. Ream out the bearing houses. LAMINATE SUPPORT: To create the laminate support - which will end up 13mm (1/2in) thick and 25mm (1in) wide - take four or five pieces of walnut (Juglans regia) and cut at 5.5mm (7/32in) by 30mm (1 1/8in) wide. Form the mould jig from old scraps of MDF and then bend and glue it up to form the arc required for the support. After two days, remove the now set laminate form and plane and sand to the required finished size. to turn down small caps to cover the bearings and spacers in walnut - see drawing for this step. Next, bore an 8mm (5/16in) hole through the centre. I chose to turn the base in two pieces of walnut, but you may choose a base design to suit your preferences. I bored an 8mm (5/16in) hole through the centre of both pieces and made a 25mm (1in) recess in the base to allow for a star nut. THE MAP: Obtain a gore map and have it enlarged to the correct size; I used the diameter of the globe and measured the equator - this will give you the correct measurements from pole to pole. Cut out the wings on your map and stick it to the globe with wallpaper paste. 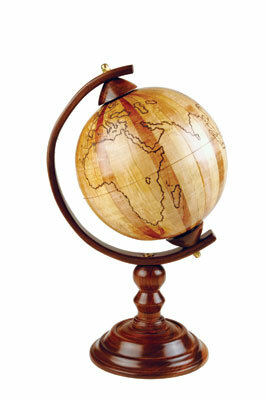 Remember that using sanding sealer on your globe will stop it from staining. When the paste is dry burn in the outline of all continents and islands with a pyrography tool. You do not have to be too exact with your marking. You can then remove the paper map - I used greaseproof paper to trace the map. ASSEMBLY: Bore an 8mm (5/16in) hole in the support allowing a 25mm (1in) gap equal and parallel to the globe. Bolt the globe to the equator ring with a 6mm (1/4in) metal thread - including the bearing caps - and finish with brass dome nuts and washers. 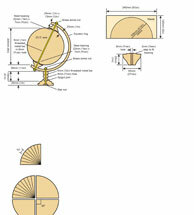 Bore an 8mm (5/16in) hole through the equator ring to form a 23.5° tilt to the globe. Bolt the support to the base with a 6mm (1/4in) metal thread and finish with brass dome nuts and star nuts to the under base - see drawing. FINISH: All parts of the globe can now be finished. After final sanding, use sanding sealer and finish with finishing oils.